My kids want a sofa that is longer than the one we are using now. They want more space to lounge while reading, studying or watching tv at the sala. Brand new and modern sofas are expensive so hubby and I were thinking of having a customized sofa in the future. If there’s sufficient budget for this one I would like our customized sofa to look something like the photo below – stylish and comfortable. It will definitely make our small sala looks neat. Kids will surely choose this one, too. 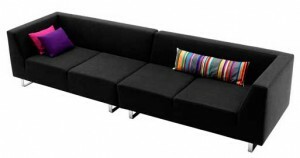 This entry was posted in Product review and tagged modern sofa, sofa on February 16, 2011 by Yami. I would love to change ours,too;) my girls are still small and they tend to stain our sofa all the time.